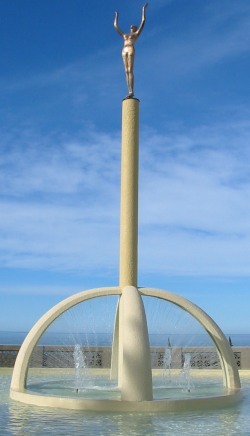 The 3.6 metre column overlooks the southern portion of Napier's Marine Parade. The pavement and sheltering wall form a half circle: the column supporting the sculpture is surrounded by a moat and the area in front has two large stone seats facing seawards. The work of Hungarian - born Auckland artist Frank Szirmay, it represents Napier rising from the ashes of the 1931 earthquake. It also shows the prosperity won in Napier since the earthquake. The statue, standing in the Gilray Reserve, was given to Napier by the late Dr. Thomas Gilray, a former superintendent of the Hospital. Finance was provided from the Gilray Estate $8,000, a donation from Mr L.E. Harris (now Sir Lewis) - Brooklands $5,000, and $14,000 contribution from subdivisions set aside for expenditure on public reserves. The centrepiece was lifted into place on 7 December 1971, but was not unveiled until December 22 of that year. 150 people attended the ceremony and the chairman of the Queen Elizabeth II Arts Council, Mr W.N. Sheat, of Wellington, unveiled the statue. The Mayor of Napier at that time, Sir Peter Tait said the sculpture had been aptly named and depicted the rebirth of the city.